Thread: Super newbie needs help. I'm considering purchasing my first boat. I live in South Fayette and plan on spending weekends on the boat and hopefully taking the kids(12/15) with me when I can. I would really like to be able to sleep on the boat with the kids and spend long weekends with reasonable amenities(toilet, small fridge, some way to cook)etc.. I'm definitely thinking something used and under 50k but I have no idea what kind of boat or even what size to handle the local waters or even where to keep it. ANY input would be really appreciated. Are you looking at boating the rivers or lakes? 50K will get you a nice boat. If you buy a 50', you will find a need for a 55. I'd recommend at the very least 26'. I would recommend something with a generator if you plan on camping out away from shore power for those hot sticky nights. When we first decided to get a boat, we went to the boat show that comes around in January not to purchase one but just to get an idea of the different sizes and types of boats out there. We learned a lot from talking to the different sales reps. It helped us narrow down exactly what we were looking for in a boat. We started out by trailering it but now dock at a marina and find that we use it a lot more. Our first boat was 19 feet and we quickly figured out that wasn't enough space and upgraded to a 23. You always need more room than you think! Good luck in your search. It's a fun way to spend the summer! I think this is what I'm going to do. I stopped by FCYC today to see what they had used in stock and nothing jumped out at me. At least nothing under 50k. Since the season is basically over, I'll just wait and go to the boat show over the winter. Once you have an idea as to what you want, consider expanding your location search. I went to Baltimore to get my cruiser and it saved me $10000. I paid $50k and the same boat here was listed above $60k. There are a lot of good deals in the midwest as well. We also had to look outside of the local area. We found what we wanted in Scranton and like Cableguy Greg, we saved about $10,000 on what the same boat was listed other places. My husband almost considered going to look at one in Canada, which was ridiculous and glad I talked him out of it, LOL. The watersports question needs to be answered. You can buy a cuddy or pocket cruiser in the 22-26 foot range that will still tow a tube, waterskis, or wakeboard, but watersports gets gauche over 26 feet. a 22 will be tight sleeping quarters, less so in a 26. Also consider that your kids might want to bring friends. If you just want to swim and float, any size will do. We have done both the lakes and rivers. Rivers seem more for swimming, adult party fun, and day and night use. Many ladies won't even get in the river due to dirt unless its very hot outside. The lakes are more for kids, watersports, and daytime use, although the margaritas still flow for the adults. Lots of great lakes to explore from Ohio to West Virginia if you are adventurous and willing to put up with the hassle of stuff going wrong and trailering while finding the road less traveled (ask me how I know). Thanks! The more I dig into owning my first boat, the more complicated it becomes. I never realized how difficult it would be trying to find a boat, So many of them are in really bad shape. Also, everyone keeps telling me horror stories about how difficult boats are to maintain. I also need to consider how much my truck can tow. I have a Ram 1500 with the tow package and the hemi. Then there is the slip fee, that was a big shocker. It's going to take me all winter to just to find a boat and a "reasonable" place to keep it. I'm really hoping the boat show this winter will help me choose. I definitely want a toilet, galley, beds and heat/ac. I was thinking about a Gibson houseboat, but they are kinda fugly looking and most of the used ones are trashed. My current favorite is a 38' Carver or something similar. Although I'm not sure what they weigh. It's kind of a catch 22. You buy an older boat, you take the risk of more going wrong but a newer boat always comes with a price! We found a boat that was 3 years old but only had 40 hours on it so almost new! If you can find one that still has a few years left on the warranty (at least on the engine) that will give you some peace of mind until you get the hang of boating. I feel if you keep up with the maintenance and keep it clean you won't have as many headaches. What marinas are close to you? Believe me-- it's well worth the slip fee vs. trailering every time you want to go out. I would also suggest taking the boater safety course (even if not required with your age) to become familiar with the ins and outs. We found there was a lot we didn't know! You won't be towing a 38' Carver with your truck, or even a 3500 diesel. I have a 2013 Ram 1500 Hemi and tow my 9000lb boat/trailer combo just fine but any bigger and I would want to go to a 2500. My boat is a 2006 25' Crownline cabin cruiser. It also depends on the brand of boat as to the weight. My Crownline is 2000lbs heavier than my 1986 Sea Ray 25' was. Also keep in mind the maximum legal trailering width without a permit is 8'6" so you are looking at maybe a 27' boat as your maximum to be legal (although I know people that tow much bigger boats). As for amenities, I would stay away from a porta potty. Get one with a pump out head. Porta potty is similar to going in a bucket and carrying the bucket to the restroom to dump it in the toilet. Good idea on the boat shows. We learned alot there. Ask questions. Thanks Boatman37. I'm definitely going to the boat show. I was downtown yesterday and there were a lot of boats around the point. That really got me thinking about getting a boat. I stopped at a marina up in Beaver last week and looked at another Carver. I definitely like the condo on the water concept. I also called a guy named Chad about getting a potential boat purchase pre-inspected. Although, at $22/ft I'll need to be sure about the purchase before I shell out $900. So, the saga continues, thankfully the season is over, so I have some time. Still my biggest concern is the potential for a major repair, due the age of most of the boats I'm looking at. Does anyone have a general idea of how many engine hours are considered high? Dealers are telling me up to 2500 until I'll need a major rebuild or replacement. Thanks again to everyone helping me. tcadaniel? time before overhaul in my opinion is more related to owner maintenance than hours. Starting about 2002 Mercury engines with the PCM-555 ECU store how many hours are on engine at various RPM bands. So it's possible to have an engine with low hours needed a overhaul sooner than a high hour engine. 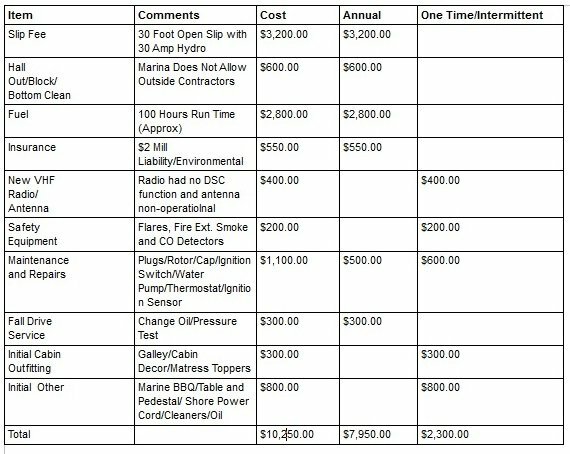 Below is an example of a ecm printout of a boat I recently purchased a 15 year old..
Yep, familiar with that marina. Ed and Ed Jr. are good guys. Don't know the boat but if it is the one I'm thinking of it was well taken care of. I would still get a survey. I have heard of that Chad that you mentioned. I don't know him or his work so can't say good or bad about him. I had Steve Colletti do my survey on the Crownline I bought in August. We dock our boat close to Boat World and just had them replace our bellows a few weeks ago. I am a member of the Rinker boating forum and one of the members posted an actual account of his first year of owning a Express Cruiser FV270. The owner of this boat lives in Ontario Canada so the dollars may be inflated by the exchange rate $1.00 CN = .75 US. Nice chart. Being $6000 US, with some of the slip fees in Pittsburgh, he is pretty close to being right. At $2414 for dockage fees, that works out to $90/foot. His fuel prices are a little high. At $5/gallon on the water, he is planning on using 422 gallons. I used 286 gallons this summer. Due to the weather and river conditions, I only took one "long" trip, which was to Kittanning. I would have done another one, but the river conditions sucked.